I wanted to mark David Bowie's passing with something quite special; something quite different to the 1974 Bowie gig already in the archives (HERE, if you haven't seen it). Something which would show a different side to the artist, and the man; I think these performances are it. These recordings were in good condition - some EQ took away some harshness and I repaired a few spots where there was distortion on the vocal. This show features 2 performances by Bowie at benefit gigs for The Bridge School, an annual event for a school founded by Neil Young and his now ex-wife Pegi in 1986, that continues to run to this day. Featuring Reeves Gabrels on guitar, Gail Ann Dorsey on bass, and Bowie himself on guitar and a bottle top strapped to his foot to keep time, these almost acoustic sets include songs rarely performed elsewhere. There are 2 sets as Bowie performed both days of the gig, over a weekend. 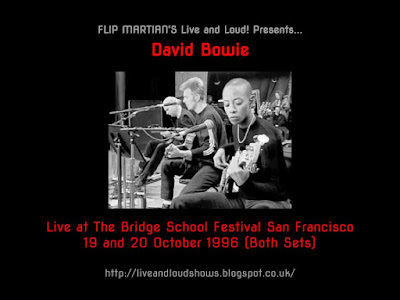 At least 1 more (probably more) remastered Bowie gig will be posted up on here over the next few months. *Update 2018* While preparing this old show as separate files for a donator to the site, I found I could now improve the sound quality further, over what I’d originally done to the recording several years ago. You can now download this new version (as of 2018) HERE as 1 new 320kbps MP3 file. Great work! This gig was crying out for a remaster, so thanks for this. Please keep the Bowie bootlegs coming. ...oh Flip, let me kiss your feet. Thanks a lot for this acoustic gem!!! haha, no need for that. Glad you enjoyed it.